The Friday Funny Sign — Picnic in a Prison Park? Travel Oops is introducing another new feature: “The Friday Funny Sign.” Whether they have a unique translation, bizarre concept or just grab your attention, signs can be a huge source of entertainment while traveling. Consequently, Travel Oops will showcase funny or unusual signs. 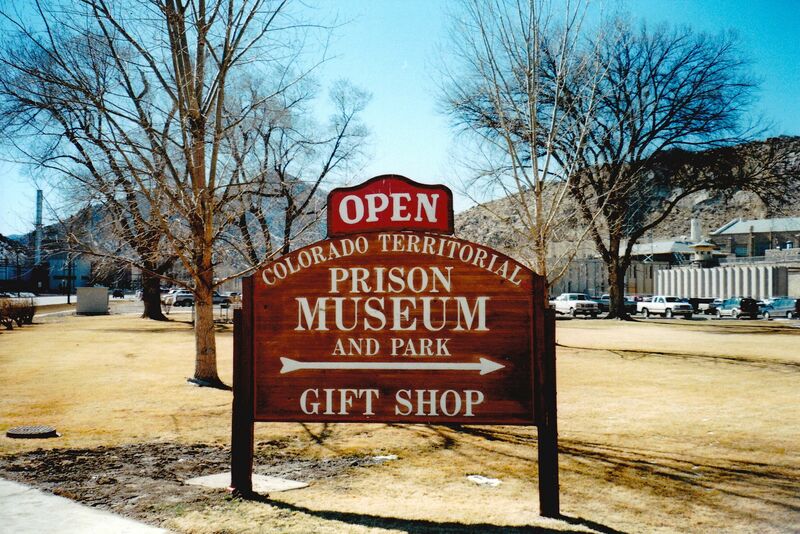 This photo is from the Colorado Territorial Correctional Facility (CTCF) in Cañon City, CO. Having a park, gift shop and museum right next to the actual prison just seems so out of place. If you look closely, you can see razor wire in the background of the photo. In all fairness, I haven’t been to the park, museum or gift shop; it all could be lovely. Up until the 1990’s, the CTCF housed Colorado’s death row. As a result, there is some history, but wow — a family picnic at the Prison Park??? And the gift shop?? What do they sell? An electrical switch or hand cuffs, striped apparel?? I suppose ultimately, you would be somewhat safe, since no escapee would hang out at the gift shop or park next to a prison, and there would be plenty of security….but….again, hmmm. Actually, it would be interesting just to check it out and have a picnic there so you could say you had done it. This entry was posted in Bizarre tour stops, Colorado, Funny signs, Humor, Travel, Uncategorized and tagged bizarre travel stops, Colorado, funny signs, prisons, strange ideas by stephglaser. Bookmark the permalink.